Gumi is located in the western part of Korea's North Gyeongsang Province, 277.5 km. south of Seoul and 167 km. north of Busan. The Gyeongbu Railroad line and Gyeongbu Expressway cross the city. The Nakdong River flows north to south through Gumi. Gumi is very important for South Korea's economy. It contains more than 725 companies with over 80,000 workers. Around 450 companies are located in Gumi National Industrial Complexes 1, 2, 3, and 4. 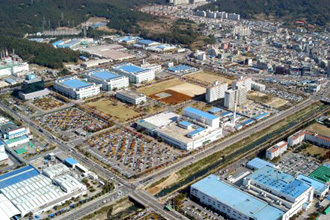 The rest operate in the Sandong, Goa, and Haepyeong rural industry complexes. Major production: High-tech electronics like LCD's, CRT's, and telecommunication equipment. More than 10% of national export is generated in Gumi. Park Chunghee, Korea's 5th to 9th President, was born in Sangmo-dong, Gumi, on November 14, 1917. He became a famous president by modernising the nation after the Korean war. Although Gumi city is an industrial city the surrounding areas have a number of cultural and recreational tourist destinations. Geumo-san Provincial Park and the Nakdong River provide several touristic opportunities. There are historical and cultural sites as well.